Paul Holleran is refusing to get carried away by Leamington’s return to winning ways. Brakes beat Frome Town 2-0 on Saturday to secure their first Southern Premier Division success since November, halting an alarming slide down the table in the process. 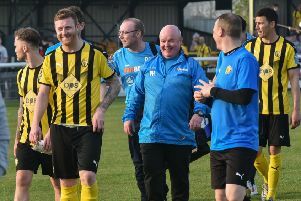 However, while relieved to end a ten-week wait for three points, the Leamington boss said the quality of their recent performances meant a win was always around the corner. “It’s good to be back winning again but it’s just one little step,” said Holleran. “I’ve been saying for weeks that the levels are where they need to be. “And on Saturday it was another hard-working, polished performance where we controlled the game for long periods. A stunning Connor Gudger strike broke the deadlock and, after being on the receiving end of a number of spectacular strikes during the winless streak, Holleran was delighted to see a change in fortunes, even if it did come from an unlikely source. “It needed something special to beat (Darren) Chitty. Leamington followed up Saturday’s win with a disappointing Red Insure Cup exit at Aylesbury United on Wednesday night. With one eye on tomorrow’s juicy league clash at Weymouth, Holleran used the tie to give rare starts to Will Green and Rob Ogleby, while resting leading scorer Ben Mackey. The Terras’ title push has hit the buffers in the last week following successive defeats but they still lie in fourth, seven points clear of Leamington. And, with Brakes holding four games in hand on their hosts, Holleran knows a positive result could dramatically alter the play-off picture. “Weymouth up to a week ago would have been thinking about winning the league, but they’ve lost the last two and it’s all doom and gloom. Lee Chilton was left out at Aylesbury as a precautionary measure after injuring his shoulder against Frome but should be fit to return tomorrow, while Joe Magunda is also pushing for a recall after being given some time off following the birth of his daughter Isla. Meanwhile, Holleran has explained away the absence of Joe Halsall who has not featured for Brakes since their defeat at Chippenham on January 9. “The scenario is that he has come to us and in the process his wife has given birth and they have bought a house which needs a lot of work doing to it. “He wants some time off to get everything right at home and he couldn’t commit like we would have wanted. “The biggest problem is the work required was more than he thought.